Organic lawn management can help you easily grow a nice looking lawn. Here is a simple organic lawn management program that can help to produce a beautiful lawn. This organic approach builds up the soil as it feeds the grass. Calcium is considered as the king of crop nutrients. Calcium helps to mobilize other nutrients in the soil, and is very important to plant health. Hard clay soils are generally that way because of too much magnesium. If your soil is low in pH and is clay, you will want to request "High Cal. Lime", as it is lower in magnesium, and will help to loosen up your soil. If your soil pH is high (as found in the Midwest), use calcium sulfate, also known as Gypsum. Calcium Carbonate and Calcium Sulfate are both natural products. 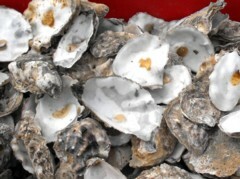 A typical application of calcium is one or two 50 lb. bags per 1,000 sq. ft. once or twice a year. It’s a good idea to do a soil test to guide you in how much to apply. I use a mulching blade on my lawnmower. It helps the grass clippings fall down to soil level, where they will quickly decompose. Grass clippings are a great source of nutrients for organic lawn management, plus provide organic matter that feeds the microbes in the soil. Since I don’t water my lawn much (watering leaches out nutrients), and I use a mulching blade on my mower, it really cuts down on the amount of nitrogen I need. Blood meal, feather meal and fish meal are all common organic sources of nitrogen. However, I use a free source of nitrogen! If you can get over the “ick” factor, human urine is also a good source of urea nitrogen. A single person’s urine can supply the nitrogen needed for 5,500 sq. ft. of lawn. The average acre of land has 4,000 pounds of phosphorus. The problem is, most of it is not in an available form. 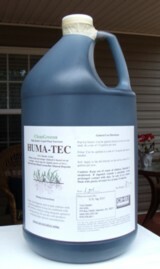 I use Huma-Tec, a soil conditioner, which helps to make phosphorus available. This more than meets my need for phosphorus. I apply a little over 2 gallons per acre (one ounce for every 150 square feet) each fall. 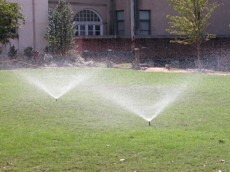 It not only releases phosphorus, but helps to reduce thatch and improve the soil. I have seen quite an increase in earth worms, which are great aerators of the soil. As you may know, worm castings are invaluable for their nutrient content. A couple of common sources of potassium for organic lawn management are Greensand and Kelp. On average, 1.5 pounds of potassium is needed each year for 1,000 square feet of lawn. If your soil is below 6.5 pH, you can use wood ash as a source of calcium AND potassium. The application rate is about one pound of ash for every 100 square feet. Just clean out your fireplace, and sprinkle it on your lawn. Wood ash raises the pH of soil, so be careful. It is best to get a soil test to see just how much your pH needs to increase. Never apply more than 2 pounds per 100 square feet. Wood ash from hard woods is the equivalent of a 0-0-5 fertilizer. Last but hardly least, your lawn needs sulfur, magnesium and trace minerals. A good all in one package is concentrated sea minerals. An 8 ounce bottle fertilizes 2,500 square foot of lawn a year. I have seen these ocean trace minerals make an incredible difference in my lawn. A healthy lawn is the best defense against weeds and disease. If you follow the program on this page, it can help to create healthy soil, which makes for a healthy, thick lawn that does a better job crowding out weeds. I do have clover in my lawn, but I consider it a blessing. Clover is a legume. It captures nitrogen from the air and fixes it in the soil. One of the best defenses against crab grass is to set the lawn mower on a fairly high setting. To deal with an epidemic, simply cover crab grass with black weed cloth for 10 days, after which the crabgrass is dead, but the regular grass is only yellowed, and can recover in a couple of weeks. I hope this has given you some ideas how to use organic lawn management. When you get a chance, check out my home page, Healthy Vegetable Gardening. Please share your insights in the box below. that they may be helpful to you as well. based upon your research and in partnership with your doctor.